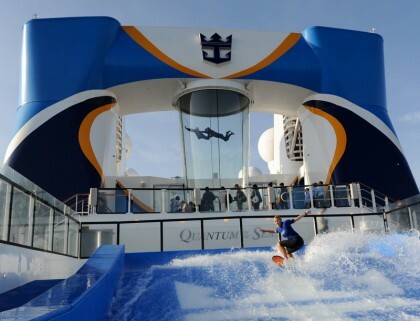 Photography on the top deck of Royal Caribbean's new cruise liner Quantum of the Seas. AG Studios’ photographer Arif Gardner had the pleasure in photographing the maiden voyage of Royal Caribbean's new cruise liner “Quantum of the Seas”. This state of the art smart-ship boasts the latest gadgets including the robotic bar. Jason Bradbury from Channel 5’s The Gadget Show was onboard with 500 of the world’s media to see the splendour. The liner boasts the North Star, a London Eye type capsule on an extendable arm that rises high above the deck showing the most incredible view of the horizon as you look down at the whole liner. A great job, an absolute honour to be aboard.